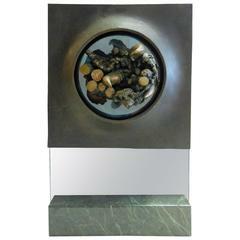 A steel sculpture with a black enamel finish. Nice size, could be displayed on a pedestal, on top of a table or on the floor. 1970s sculpture. Polished aluminum and clear Lucite. It has an intricate multi layer design arranged in an almost futurist manner. Signed RH and numbered 3 of .9. A very substantial sculpture. Quite stunning. Signed and dated 1974. A great example of Mr Seandel affinity with metal. Could be hung horizontally as well. Contemporary outdoor large abstract steel painted sculpture model L'oeil Du Cyclope Garden sculpture, metal sculpture. Contemporary outdoor large abstract steel painted sculpture, model Silhouette Garden sculpture, metal sculpture. Contemporary outdoor large abstract steel painted sculpture, model red light with a led lightening inside. 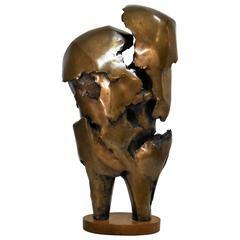 Abstract sculpture carved with three different faces is perfect for a center table location or garden.